Good home care is important if gum disease and tooth decay are not to progress to more serious problems. A clean and healthy mouth will help to improve your appearance and self confidence; it will also give you fresh breath. Maintaining excellent oral hygiene standards during orthodontic treatment is so important ensuring that you are cleaning your teeth regularly and correctly as well as following a diet that is good for you, your teeth and your braces is crucial. Developing and maintaining these best behaviours from the outset of your treatment will really help to ensure a great result in the quickest time possible. Always use a medium bristled or specialist orthodontic toothbrush. Brush at 45 degree angle where the teeth meet the gum. Always brush behind the teeth and along the biting surface. You should be brushing 3 times a day or after you eat. 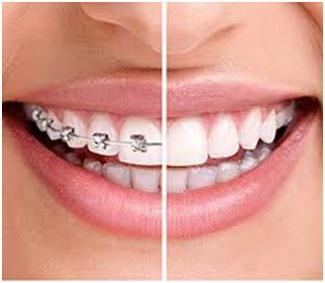 Orthodontic Toothbrushes – Specifically to clean under archwires reducing or eliminating unsightly decalcification. The 3 bristle lengths simultaneously clean the bracket, tooth and gums, while the longer outer bristles can be angled to effectively reach and clean underneath the archwire. Interspace brush – this brush has a single tuft to reach and clean awkward areas if the mouth. Ideal for removing plaque from larger spaces between teeth and along the gumline, a great way to ensure top oral hygiene. Interdental brush – an alternative to dental floss, they are designed for cleaning between the teeth , below the gum line and around appliances (e.g braces & bridges). Suitable for anything but the tightest of contact points, most people find these easier to get to grips with. To remove plaque, you should brush around all parts of your dental braces and all of the surfaces of your teeth. Ideally, you should brush after every meal or snack. If you can't brush right away, rinse your mouth well with water. Cleans away debris that other devices miss, you just point the flosser tip between your teeth and along the gumline and let it do all the work for you.